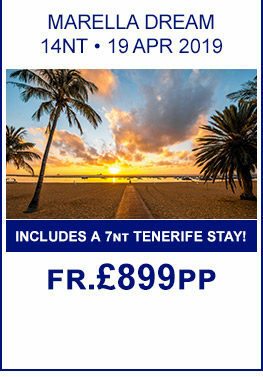 Marella Cruises is the UK’s third largest cruise line, operating a fleet of leading ships and itineraries through the most delightful parts of the planet. Designed for explorers, families and first-time cruisers alike – Marella Cruises have carefully planned each itinerary to take guests to the heart of unique cultures and regions. From the relaxed, charming Greek Isles to the awe-inspiring Norwegian Fjords – Marella Cruises will introduce you to exceptional experiences across the globe. With the TUI group’s extensive reach across the holiday sector, Marella Cruises offers seamless and effortless holidays around the globe. With incredible tours, led by local experts, available when you call at port, a peerless crew of dedicated professionals, and on-board features to amaze all guests – Marella Cruises provides a spectacular at-sea experience. 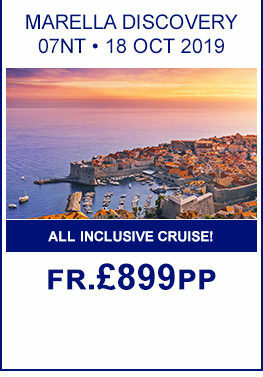 Take a look at our 4 top offers for Marella Cruises! 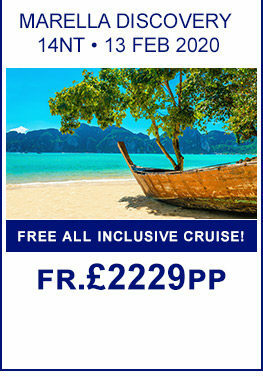 All Inclusive Cruise! , Full Package with Transfers! 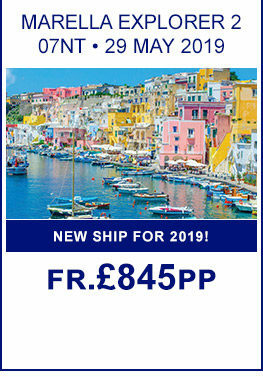 What’s Included in a Marella Cruises Package? When you book a Marella Cruises package, you get so much more than just a cruise. You can fly from 22 regional UK airports, and the much-loved Cruise & Stay programme – giving you the chance to stay at one of more than 140 hotels across 10 destinations worldwide. From the moment you leave home, Marella Cruises will take care of everything to ensure you have an unforgettable time exploring the world’s most delightful regions. Additionally, Marella Cruises includes all tips and service charges in the price of the package – meaning you’ve one less thing to worry about during your holiday. With amazing dining venues included in the price of your holiday, you’ve barely a reason to get the wallet out when holidaying with Marella Cruises. All of this is supported by the friendliest team on the seas – guaranteeing your every need and whim is met with a smile and a helpful hand. During your stay on board the Marella Cruises fleet, you’ll be absolutely spoiled for choice when it comes to dinner time. From well-stocked sushi bars and elegant dining rooms to family-friendly pizzerias and crowd-pleasing buffets: every ship in the Marella Cruises fleet offers culinary delights to please every palate and appetite. One of the fleet’s most iconic eateries is the Kora La, the Pan-Asian dining venue packed with the best-loved dishes of the Orient and beyond – all with a delightful twist. Found on board Marella Explorer, Discovery, Discovery 2, Dream and Celebration, Kora La provides a great introduction to this amazing cuisine for newcomers as well as new delights for those who already love the flavours of this region. With between four and 11 different dining options found on board each ship in the fleet, there’s plenty of options to suit every member of the family – and guaranteeing a wide range of different dining experiences night after night. From stylish cocktail bars to Broadway-style lounges; there’s so much to see and do every night on board a Marella Cruises voyage. Whether you’d prefer a quiet and elegant evening spent with your significant other over an espresso martini, or an extravagant night watching dance troupes and world-class shows – Marella Cruises provides the perfect entertainment. And if you feel like striking it lucky during your time on the sea, every ship in the Marella Cruises fleet plays host to a well-stocked casino. From craps and roulette to poker and blackjack, the fleet features all your favourite Las Vegas-style games. Marella Cruises is continuing Thomson’s proud tradition of creating cruises which provide exceptional experiences for all ages – in particular, the youngest members of the brood. Marella Cruises proudly host popular kids’ clubs, headed by experienced staff, offering fun games, activities, arts, crafts and experiences - including the chance to venture up to the bridge and watch the ship’s captain in action. The older kids will be equally delighted on board the Marella Cruises fleet – with a range of activities designed for teens. Amenities such as rock-climbing walls, mini golf courses, karaoke booths and interactive games will keep them entertained throughout. And when the night falls, the teens will be delighted by the on-board discos – pumping out the latest tunes.